YOU DON'T HAVE TO BE A VEGAN TO LOVE VEGAN FOOD! Want to cook vegan food at home but don't know where to start? Think vegan food is expensive? Unsure where to find the ingredients? Our challenge to you is to go vegan 1 day a week. 1 day. 5 ingredients. It's that simple. So whether you're a full-time vegan, a curious carnivore or simply somewhere in between, So Vegan in 5 is your go-to guide for eating more delicious plants, packed with budget-friendly and time-saving recipes for the everyday cook. Vegan couple Roxy and Ben launched 'So Vegan' just over two years ago with the mission to revolutionise the way we think about vegan food. Nothing like So Vegan existed at the time, so the couple decided to take a leap of faith: they devoted all their spare time to developing and filming plant-powered recipes from their cosy south London flat. 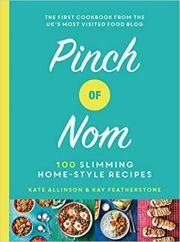 Fast forward to today, their channel now has over one million devoted followers and their recipes reach a staggering tens of millions of people around the world every month. This book is bursting with over 100 exciting, all-vegan, low-cost and low-ingredient recipes for the time-poor cook. You'll find quick and easy breakfasts, simple and healthy light meals, classic dinners and indulgent desserts, plus so much more. As well as stunning everyday recipes and foodie tips, the book also contains helpful advice on how to live a more sustainable life.